Reel Cinemas, a cine brand under Emaar Entertainment, the leisure and entertainment arm of UAE developer Emaar Properties, has redefined the movie experience with unprecedented firsts that will awe and delight movie-goers at Reel Cinemas – The Dubai Mall. 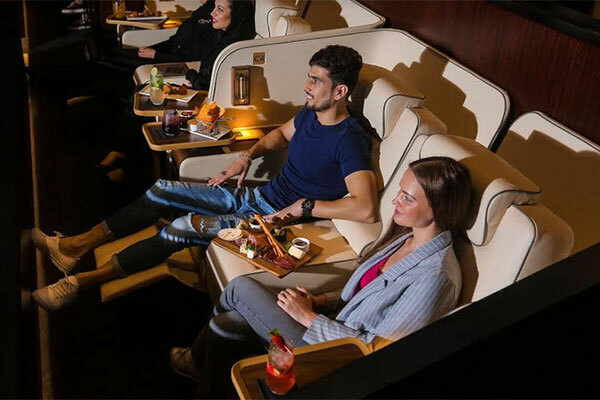 The new features include the Platinum Suites, Dine-In-Cinema experience with Guy Fieri’s signature menu along with International cuisines, as well as a standalone 170-seater Guy Fieri’s Kitchen, the stunning cinema experience with Dolby Cinema and the first ScreenX in the Middle East. For those seeking a VIP-style deluxe experience, head to the Platinum Suites at Reel Cinemas – The Dubai Mall, and be pampered with upscale amenities, personalized butler services, never seen before luxuriously unique seats with an unrivalled private lounge and savour five-star gourmet choices - all fresh and made to order. For those looking for a fully loaded menu with bold flavours and unique twists on traditional dishes, head to the 170-seater independent Guy Fieri’s Kitchen and immerse in a food delight. Indulge in his renowned dishes, such as his signature Trash Can Nachos, Tuna Poke Tacos, Chicken Wings, Crispy Chicken Bacon Ranch, Smoked Barbeque Short Rib, Award Winning Bacon Mac N Cheese Burger, Triple-Double Mint Pie and much more. And with ScreenX, the Middle East’s first of its kind only at Reel Cinemas - The Dubai Mall, cinema lovers can experience the world’s first multi-projection system that provides a panoramic film viewing experience within a theatre setting.